To start off - everyone's getting a haircut to prepare! "Wardrobe Fitting for Ender's Game!" Question that's been bugging me, and maybe I'm just not down with one specific fact, but why, exactly, is everyone in New Orleans? What's down there? I've never heard of anything filming there before. They're currently training at Space Camp there, as per their tweets. Much like the cast of Apollo 13 also trained at a Space Camp in Alabama prior to their filming. I went there as kid. You're never too old for Space Camp, dude. But on topic: so yes, something obvious that I missed. Thanks guys! According to their tweets, the actors playing Stilson and Peter will both be in NOLA soon, to join the rest of the cast and crew currently there. "So excited to be in New Orleans! Let the games begin... "
“Amazing #EndersGame read-thru yesterday (I read opposite Harrison Ford and somehow resisted the impulse to giggle like a schoolgirl). I was trying to recall if Graff ever talked to Peter? I dont recall a circumstance. Note that the script is dated January 5, 2012 with revision pages noted for January 30 and February 8. Is that a ‘Cast Members’ list I see on the left-hand side? Anyone want to attempt to decipher? Ive been trying to enlarge that area, but I cant get a good enough resolution. Yoda wrote: Ive been trying to enlarge that area, but I cant get a good enough resolution. Not going to lie, I LOL'd. 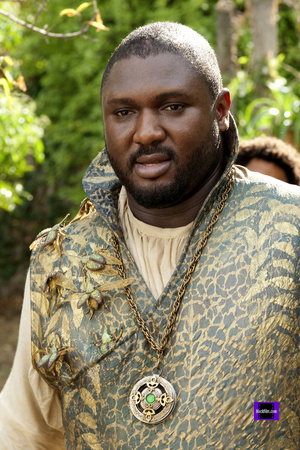 Nonso Anozie plays Dap, and Stevie Ray Dallimore is John Paul. Cool! Hmm, I hadn't pictured Dap that way, but I think he'll do a fine job. On the other hand, John Paul doesn't look particularly Polish, which takes away some of the dramatic irony of Ender's thirdness. Maybe they'll make him an Irish Catholic instead? The guy they got for Dap is not what I imagined for Dap, but he does look like a Military type guy with his build. Oh the Father of Peter, seems ok to me, but then I was thinking that the mother was blond,,,Peter is blond. Maybe they will make Ender Blond. Or Maybe they will make all 3 of them go dark hair. What do you all think? spanish_rockette wrote: I imagined Dap to be more feminine, but he does look the military type. I also assumed "mom" was mostly an ironic title and not reflective of Dap's personality/body-type. Replace that with a military uniform, and *bam*. Dap. Asa Butterfield: "First day of filming today! So excited "
Extras Casting Director: Alexis R. Allen ‏ (@alexisrallen) "Day 1 of 70!" Does anyone know anything about what Scenes they are filming and when? Someone throw us a bone! Producer Roberto Orci: (@boborci) "And... ACTION! We started shooting Ender's Game this morning!" Taalcon wrote: Producer Roberto Orci: (@boborci) "And... ACTION! We started shooting Ender's Game this morning!" I can't wait to see some production photos! Oh, and I'm totally buying the movie poster as soon as it's up for sale.. And the trailer!!!! Oh my goodness, I'm so excited!!!! Interesting press release, with some... surprises. "Ender's Game" has finally begun. After weeks of pre-production and a steady trickle of casting announcements -- including names like Harrison Ford, Ben Kingsley, Asa Butterfield, Viola Davis and Abigail Breslin -- principal photography on director Gavin Hood's big-budget, big-screen adaptation of the sci-fi saga began today (Feb. 27) in New Orleans. The production, which has set up at Big Easy Studios in eastern New Orleans, is scheduled to continue shooting through June 8. Producers are targeting a March 15, 2013, release date. "In the near future, a hostile alien race (Formics) have attacked Earth. If not for the legendary heroics of Commander Mazer Rackham (Ben Kingsley), all would have been lost. In preparation for the next attack, the highly esteemed Colonel Graff (Harrison Ford) and the International Fleet (IF) Military are training only the best young children to find the future Mazer. Ender Wiggin (Asa Butterfield), a shy, but strategically brilliant boy is pulled out of his school to join the elite. Ender easily masters increasingly difficult war games, distinguishing himself and winning respect amongst his peers at Battle School. Ordained by Graff as the IF's next great hope, Ender is promoted to Command School. Once there, he's trained by Rackham himself to lead his fellow soldiers into an epic battle that will determine the future of Earth and humankind." Davis -- who competed for an Oscar last night (Feb. 26) at the 84th annual Academy Awards for her role in "The Help" -- plays Major Anderson, a military psychologist charged with oversees the emotional welfare of the young trainees. Breslin is Valentine, Ender's sister. Note: First official public statement of 'Major Anderson'. Other cast members include Hailee Steinfeld, as a friend of Ender; Nonso Anozie as a hard-edged drill sergeant Note: Check out this description of Dap! ; Stevie Ray Dallimore and Andrea Powell as Ender's parents; and Jimmy "Jax" Pinchak as Peter, Ender's brother. Other roles, as outlined in the press release, have been filled by Aramis Knight as "Bean," Moises Arias as "Bonzo," Suraj Parthasarathy as "Alai," Conor Carroll as "Bernard," Khylin Rhambo as "Dink," Brendan Soo Hoo as "Fly Molo," and Caleb J. Thaggard as "Stilson." - Note: Woah, what? Not Brendan Meyer? Was he replaced? Does this have to do with his early departure? The behind-the-scenes team includes cinematographer Don McAlpine ("The Chronicles of Narnia"), costume designer Christine Bieselin ("Tron: Legacy"), and production designers Sean Haworth ("The Thing") and Ben Procter ("Transformers: Dark of the Moon"), the release said. Alex Kurtzman and Roberto Orci -- the same team behind such big-screen spectacles as "Mission: Impossible," "Star Trek" and "Transformers" -- are producing through their Kurtzman/Orci Paper Products shingle with OddLot Entertainment for Summit Entertainment. Those two look like brothers. Stilson's surviving evil twin goes on to the Battle School (instead of Achilles), and this time...it's personal. Boothby wrote: Those two look like brothers. I'm going to remain in the thinking that Meyer just wasn't available to do all the scenes because of his other shows. I'm hoping that its just a switch in casting -- not a switch in story. I'm still hoping that there's a secret Achilles casting in there somewhere that they're wanting to keep secret... same with Carlotta. Probably not, though. Roberto Orci [producer]: "sorry, no spoliers this early!" Taalcon wrote: I'm still hoping that there's a secret Achilles casting in there somewhere that they're wanting to keep secret... same with Carlotta. Probably not, though. Maybe...that's what they're doing with Meyer. He's one of the older kids cast, maybe taller. If they want a scary-looking Achilles, Meyer wouldn't be the worst choice. If true, that may just mean the movie ends after the final battle. No images of older ender with the hive queen egg. OR...if it would be a spoiler, maybe its the reverse. Maybe they have an older ender who does just that, and the movie ends like the book does. Who knows? All I can say is that I'm REALLY excited. Wish I could tell you where I read this, but I believe Archilles is only to be mentioned in the movie. I think it was during casting that I read Bean would be showcased more and with only a mention of Achilles.